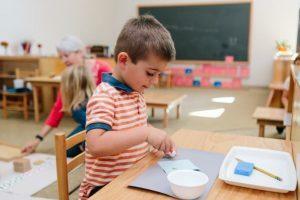 The Quest Montessori School environment for children from three to six years of age is called Primary. Primary is designed to be homelike, welcoming, aesthetically pleasing and orderly so children come to think of the setting as a ‘mini-community’ where they learn skills they can apply at home, and in the wider community. 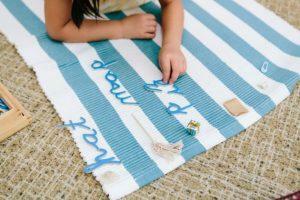 For the young child, learning is a process that involves all the senses. 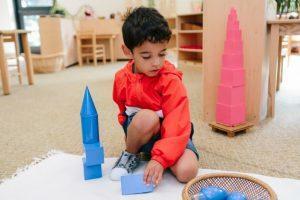 Dr. Maria Montessori created enticing materials for children to manipulate, and through their exploration, understand higher-level concepts, develop inner discipline and foster their natural curiosities. She discovered that given the proper amount of guidance and freedom, children develop a positive sense of self and their community. For this age group, lessons are usually given individually and once given, the activity is added to the child’s repertoire of possible activities to choose whenever they wish. Small group activities include games designed extend earlier lessons, gathering songs and language games. Classroom materials are displayed on open shelves, always accessible to the children. 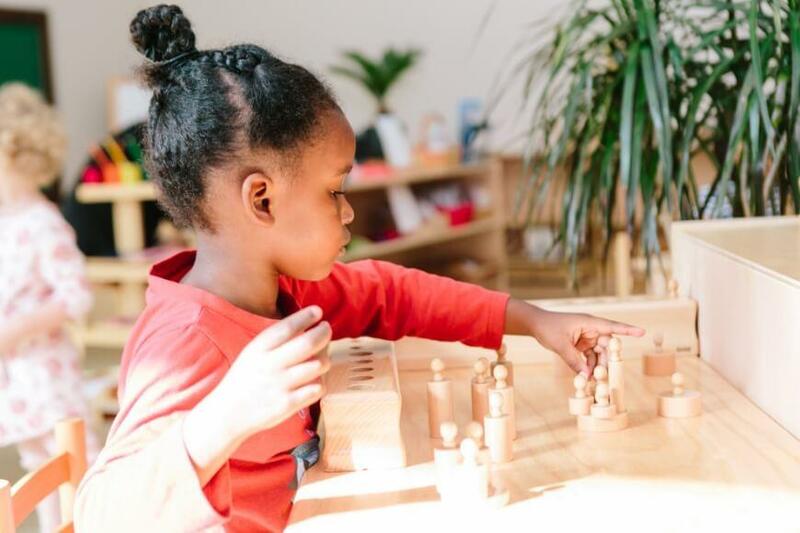 The children work with these materials during a 2.5-3 hour “work cycle,” allowing them to develop and follow their own natural rhythm of activity, curiosity and rest without unnecessary interruptions.  There is a strong emphasis in Primary on the development of independence, peer-cooperation and the skills for daily life that will enable each individual to become a valued and autonomous member of his or her community. The magic of a Montessori mixed age group is that older children can validate their learning by becoming the ‘experts’ in the room. Peer teaching occurs when the older children share their knowledge and skills, take on the role of the caretakers of the classroom and provide role models for younger children. Younger children find a group of willing friends ready to help them when help is required, and are also further inspired and motivated to learn as they see older children working on the next step in the progression of lessons. 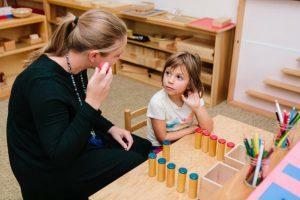 There are four main components to a Primary classroom: Practical Life, Sensorial, Language and Mathematics. 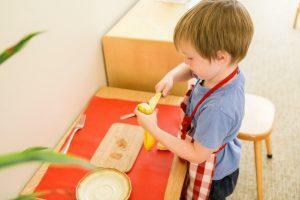 In the practical life area, children can choose from activities such as preparing snacks for themselves and others, laying and clearing the table, and cleaning up. 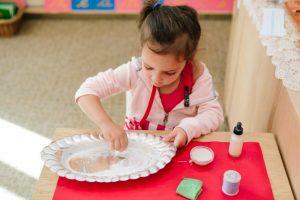 They learn, with adult supervision, to use child-sized tools, including knives and glassware, safely and effectively. In the sensorial area children fine-tune perception, discrimination and judgement leading to a foundation for abstract thinking and creative expression. In the language and mathematics areas children are introduced to literacy and numeracy skills. As they work through the language activities, children extend emergent and beginning literacy skills leading to fluency in both writing and reading. Mathematics activities lead children from early counting and matching experiences towards increasing understanding of number patterns, the four operations, number facts and two- and three-dimensional shapes. Incorporated into the curriculum are materials, activities and exercises that introduce children to visual arts, music, physical education, science, geography and history. 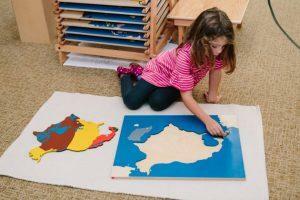 Montessori educators sometimes say that Primary is designed to bring the world to the child. For example, children listen to stories and learn songs and dances from their own country and around the world. They also work with globes, maps, land and water forms and collections of pictures of life in different cultures. 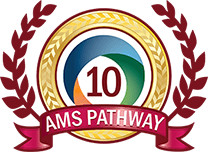 Cultural studies of this type are interspersed within the main learning areas, particularly within the sensorial and language activities. Classroom visual art activities include drawing, painting, design work, collage, printing, flower arranging, sewing and handiwork, modelling with clay, colour mixing, art appreciation cards, wall pictures and stories. In general, teacher/child ratios are carefully planned so there is just enough support for the children, but not too much interference from adults in the children’s activity. Children are encouraged to be self-reliant, or to solve problems with their peers with as little adult intervention as possible. In this way, children develop self-assurance and self-esteem as they progress through the program.